Allied Security can provide every type of security for the transportation sector from simple mechanical security devices, including high-security ticket office doors, shutters and safes to computer controlled security management systems that can remotely open and close entrance doors and shutters on unmanned stations. We also provide manually or computer controlled high security custom made ticket machine enclosures to protect expensive cash holding ticket vending machines when stations and car parks are closed. The Station Guard computer controlled security management system is also able to control staff access to station buildings via individual staff PIN codes, swipe cards or even biometric finger print readers. Station platforms can also be protected from unauthorised access via movement detectors that become active when the station or depot is closed and automatically activate an alarm and the relevant CCTV camera covering the area in the 24-hour network CCTV control room. We are able to provide off the shelf or bespoke security system for any transportation security requirement from a simple CCC2 key locking system to a complete network security system. 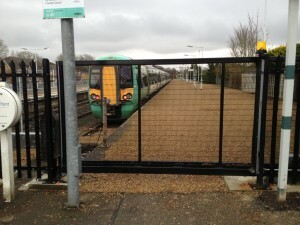 We currently provide security solutions for South West Trains, Southern Railways, London Overground and London Midland. Allied Security Providing Transportation Security Systems On Time & Budget.